1. Costs can be bifurcated into variable and fixed components. 2. Fixed costs will remain constant during the relevant volume range of graph. 3. 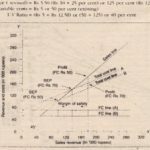 Variable cost per unit will remain constant during the relevant volume range of graph. 4. Selling price per unit will remain constant irrespective of the quantity sold within the relevant range of the graph. 5. In the case of multi-product companies, in addition to the above four assumptions, it is assumed that the sales-mix remains constant. 6. Finally, production and sales volumes are equal. The VCP graph may be prepared in a simple or elaborate manner. Figure is an example of a simple and traditional form. 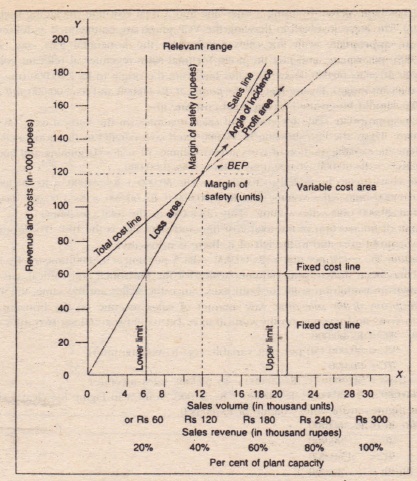 In Figure, sales are shown on the horizontal axis, the vertical axis measures costs and revenues corresponding to varying volume of sales. Sales are expressed in terms of units, rupees and percentage level of activity. The VCP relationships portrayed in such as graph are valid only within the relevant range that underlies the construction of the graph. The importance of a relevant range should he recognized because in practice most firms will progressively reduce fixed costs as the volume tends to decrease towards zero activity. Similarly, fixed costs are to be increased beyond a certain volume. Accordingly, in Figure, the lower limit and upper limit of the VCP have been drawn. The BEP lies at the point of intersection of the sales line and the total cost line. The vertical distance between the sales revenue and the total cost line measures the estimated net income (after the BEP) and the estimated net loss (before the BEP) at the related sales volume. The fixed cost line is parallel to the horizontal axis. The variable cost line is superimposed on the fixed cost line and moves upward uniformly with sales volume at the variable cost to volume ratio. This is the total cost line. The sales revenue line starts from the point of origin and moves upward uniformly with volume. The meeting point of the total cost line and sales line is the BEP. At this point, an angle is known as the angle of incidence. 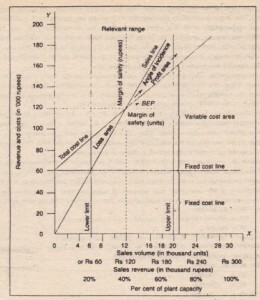 The management objective should he to have an angle of as large a size as possible because a high angles is a sign of a high rate of profit after the fixed costs have been covered: the narrower angle will profits after the fixed costs have been corned the narrower angle will signify that profits will increase at a lower rate after the BEP, showing that variable costs form a large part of cost of sales. Figure is based on the following data relating to Hypothetical Ltd.